Time constraint is a constant excuse for most of the people today living in the cities. Many people have thus shunned away from the traditional method of cooking and have adopted faster cooking methods. 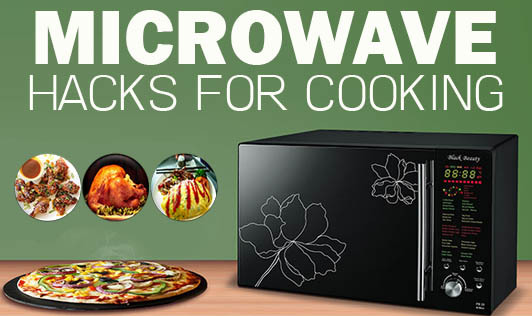 Microwave cooking is one such method which allows food to cook faster. Here are some cooking hacks and tips while preparing food in microwave. 1. Make sure that you place the food off-center as the microwave energy disperses more to the corners and sidewalls. 2. Do not allow the food to over-cook in a microwave as it becomes tough and rubbery. Give the dish a little standing time before you test it, to avoid over cooking. 3. Ensure that food is never piled on top of each other. Place food apart so that it cooks better, evenly, and quickly. 4. If possible use a round container than a square one as food cooks evenly and better in the round ones. Usually in square containers foods gets overcooked at the corners. 5. Add salt at the end of cooking instead of adding it at the start. Adding salt at the beginning leads to an increase in the cooking time. 6. Do not add more water than required, however a little water must be added to prevent dehydration of the vegetable, which results in the loss of natural juices. Addition of extra water increases the cooking time. 7. Do not try to deep fry food using a microwave as the temperature of oil cannot be controlled and can more often lead to burning or charring. 8. Do not hard boil eggs (with their shells) as the pressure inside the microwave may cause them to explode. 9. Do not cook or reheat food items containing alcohol as it is flammable and can easily lead to a fire. 10. Do not microwave food in closed containers or bottles. 11. Use deep microwave dishes for making gravies and fill the dish only to ¾ of its full capacity in order to prevent spillage. 12. Never defrost canned food items. 13. Never use an aluminum foil for covering food. 14. Never reheat sweets and desserts (ladoos, burfi, and more) with silver sheets on, as it can lead to sparking. 15. While baking, fill the cake tin only up to ¾ of its capacity with the cake batter, providing space for the cake to rise.